African soccer had its first big moment two decades ago when a little known Cameroon side dazzled its way into the quarterfinals of the 1990 World Cup in Italy. Before then, Sub-Saharan Africa hadn't made much of an impression on the global soccer stage beyond the occasional embarrassing episode, such as when a Zaire defender tried to pre-empt a Brazil free kick by booting the ball away in the 1974 tournament. But since the early 1990s, the stature of African football has only grown: top African players are now superstars in the world's flashiest leagues, while players of African descent are increasingly competing for spots on Europe's best national teams, including once homogeneous squads like those of Germany and Italy. The continent's top teams have an unprecedented chance to make a run in the tournament next year on African soil. No African team has yet to surpass what Cameroon achieved in 1990  2010 may be the year that one does. Of the six African teams participating, the host nation is perhaps the weakest, though it'll be buoyed by fanatical home support. Ivory Coast, Ghana, Nigeria and Cameroon  traditionally the dominant teams of West Africa  all have the talent to shake up the tournament. Ghana and Ivory Coast, in particular, bristle with confidence and star power. The dark horse of the African field is Algeria, which qualified only after a tense playoff match with bitter rival Egypt on Wednesday in Sudan following outbursts of violence by both teams' fans in Cairo and Algiers. The victory has catapulted Algeria into its first World Cup since the 1980s, when a "golden generation" of Algerian players upset West Germany in the first round of the 1982 tournament and qualified for the 1986 competition only to bow out early. The current crop of Algerian players, many of whom were raised in France and play for clubs there, possess the same technical sparkle of those earlier World Cup teams. South Africa 2010 is already shaping up to be one of the more unpredictable World Cups in recent memory. As many as 10 of the 32 teams arguably have the talent and experience to win the tournament, and a host of others have the ability to cause upsets. There are no runaway favorites for the trophy, either. Few would pick the defending champion, Italy, to repeat next year, and neither Brazil nor Argentina are anywhere near their scintillating best. All of Europe's leading football nations  France, England, Germany, the Netherlands, Portugal and defending European champion Spain  bear with them the weight of heightened national expectations. (Spain, Portugal and Holland have never won the tournament and England hasn't raised the trophy since 1966.) Less-heralded sides with a bit of luck may find themselves surging into the tournament's latter stages. Take New Zealand, probably the worst team heading to the World Cup. While the country has excelled at cricket and rugby  its "All Blacks" team is a perennial powerhouse in the latter  it has had far less success in soccer. The New Zealand team traveling to South Africa may feel uncomfortable not just because they're known as the "All Whites." In a tournament filled with millionaire, jet-setting athletes, the bulk of the Kiwi squad is made up of journeymen who toil in obscurity in lower-tier leagues in Europe and others who until recently were playing semi-professionally at home. A tied match, let alone one victory in South Africa, would be cause for celebration. More intriguing is the presence of North Korea, a team that, despite the odiousness of the regime in Pyongyang, carries more than a little World Cup goodwill. The country's last appearance in the tournament was in 1966 in England where, as complete outsiders with 1000-1 odds to win the trophy, its team shocked the world by reaching the quarterfinals, beating Italy along the way and capturing the hearts of the English public. The current North Korean team lacks flair, but has shown a dogged resilience in qualification matches. A latter-stage match-up against South Korea, though unlikely, would be epic. Following the sleek, well-organized World Cups hosted by Germany in 2006 and co-hosted by Japan and South Korea in 2002, South Africa has been beset by difficulties from the beginning, including construction delays, labor strikes and questions over adequate transportation links and security for hundreds of thousands of fans. But the tournament's organizers are confident these problems will be resolved in time. Since the end of apartheid, the country has hosted successful cricket and rugby World Cups, and the country hopes the soccer tournament will mark a new moment of unity in its divided history. Adversity also plagued the build-up to the 1986 World Cup in Mexico. Eight months before the start of the tournament, a massive earthquake killed 10,000 people in Mexico City and caused the media to speculate about the possibility of moving the event elsewhere. But Mexico held on to the tournament and doggedly rebuilt the capital in order to stage what many consider to be one of the greatest World Cups of all time. Quite simply, no other sporting event in the world comes close to matching the spirit of the World Cup. The Olympics may garner the attention of more global leaders and media outlets, but its myriad competitions and choreographed pageantry can never generate the unifying, almost cosmic passion that envelops the World Cup. As David Goldblatt asks in his definitive history of soccer, The Ball Is Round, "Is there any cultural practice more global than football?" It has more followers than any one religion and is more universal than any one language. Even Americans  some of whom still sniff at the sport's low-scoring games  are coming around: they are among the largest groups of fans to have already purchased tickets for South Africa. "Around half the planet watched the 2006 World Cup final," writes Goldblatt. "Three billion humans have never done anything simultaneously before." And they won't again until the summer of 2010. Read: "A Superpower Made Ordinary." 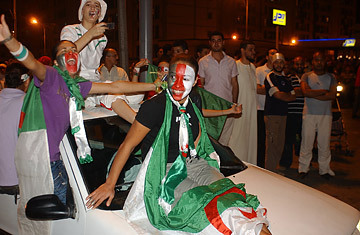 See pictures from the 2008 African Cup of Nations.